Ages 14 and up Lo-Melkhiin killed three hundred girls before he came to her village, looking for a wife. When she sees the dust cloud on the horizon, she knows he has arrived. She knows he will want the loveliest girl: her sister. She vows she will not let her be next. A Thousand Nights is filled with magic and Arabic desert mysticism that is very ancient and yet modern. That premise comprises both its positive and negative aspects for me. I base my reviews upon my faith and personal feelings for a story. It is not possible to separate my Christian worldview from my feelings. Of course this book was not written to be a Christian book at all so my worldview is really unrelated; I just want to provide a cautionary voice for those Christians who are concerned about what their children read. 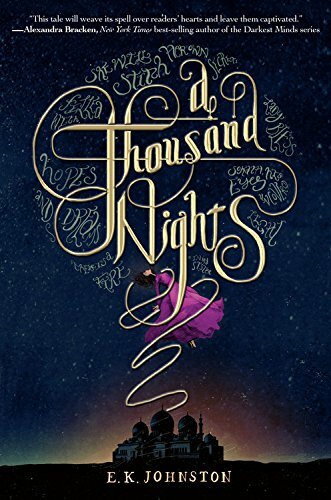 A Thousand Nights reads like a verbal history of a people group that has been passed along year after year, decade after decade, century after century. It has the cadence of a story well-worn from long telling. It is the type of story that makes you long for a perfect evening under the stars, warmed by a flickering fire, while the best of storytellers dramatically presents it to you. It is packed with imagery and the experiences related become almost tactile due to the descriptions that are done so well. Be discerning in regards to your children but this is a great read. I received an advanced reader copy (ARC) in exchange for my honest and unbiased review. My thanks to the author and publisher.